1. A high actuator option: Now those with gloved hands or large fingertips can actuate this 16mm diameter switch with ease. 2. PV6 Pilot Indicator option: This allows you to illuminate and communicate on your panel while maintaining a sleek and uncluttered panel design. The pilot indicator has the exact same housing and panel diameter as our PV6 switch, just without the switching contacts. 3. 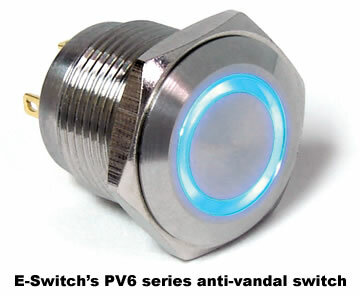 Black anodized aluminum option: This popular finish is now available in all our PV6 switches and pilot indicator options. About E-Switch. In 2009, E-Switch, Inc. acquired Lamb Industries and now offers one of the broadest switch lines available today. E-Switch h as been delivering innovative and quality switches to the electronics, telecom, high tech, instrumentation, industrial, appliance and consumer markets since 1979. Located in Minneapolis, Minnesota, their global reach extends to Europe, Asia and Latin America. Products include Rocker, Toggle, Slide, Tact, Pushbutton, Dip, Rotary, Keylock, Snap Action, Power, illuminated switches, and more. E-Switch has local reps, distributors, engineers and account managers on hand to provide specifying assistance and quick response to requests, along with a top notch sampling and cross-referencing program. E-Switch's online catalogs include complete specifications, drawings and schematics.